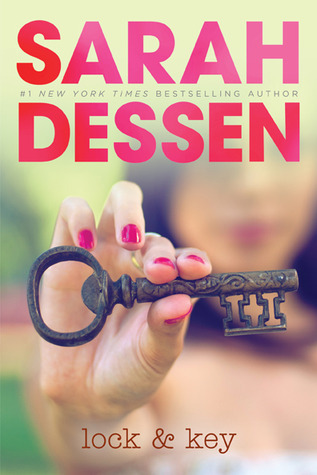 Lock and Key is the next book on my list for my Sarah Dessen Readathon, and I couldn't wait to read this book again!! This book was actually the second book I ever read by Sarah Dessen, and I remember reading it way back in 2009. I only remembered bits and pieces from the story, but reading it again was like reading it for the first time. This was yet another really great book by Sarah! One thing I've notice as I read these books for my readathon is that Sarah Dessen makes really awesome main characters. I've yet to 'meet' one that I didn't like, and I'm always able to relate to them in some way or another. Ruby in Lock and Key was no exception. I related to her in so many ways, so I totally knew where she was coming from and how she was feeling throughout the story. I love her family members; well, her sister and her husband, anyway, who were both really cool, and only wanted the best for Ruby. Her mom, on the other hand, was a real flake. The friends she meets at her new school were pretty awesome as well. The storyline for the book was, like most of Sarah's books, lighthearted, yet full of emotion. I love that there are issues in the stories that people will be able to relate to, as I know I sure do a lot of the time. And, of course, there are the Easter eggs hidden in the story; be it in the description of a character we've met before, or a place from another story. I LOVE that these are included, and I definitely appreciate them so much more now that I'm actually reading the books in order. Overall; Lock and Key is another great read from Sarah Dessen! I really enjoyed re-reading the story, especially since I didn't really remember much from when I read it way back when. My brain was happy for the refresher! Now I'm moving on to the next book on my list, Along for the Ride, which is another re-read for me, but I'm excited to get back into the story again!